Persoonia chamaepitys (picture right) is a low growing (Prostrate) native shrub with attractive foliage and yellow to orange flowers in spring, also known as the ‘Mountain Geebung’ and ‘Creeping Geebung’. Reaching a height of 20.cm an a spread of around 1m, plants can be pruned after flowering to keep in shape. 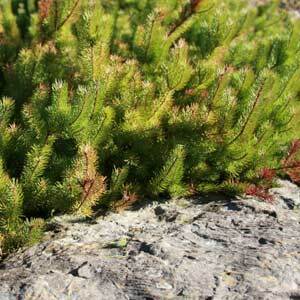 An excellent rockery plant this long lived plant is drought tolerant once established and although it grows well in full sun it is also well suited to part shade and does well under taller eucalypts. A low phosphorus native plant fertilizer early in spring is all that is needed, these plants need little care and are a hardy garden plant. Bright yellow flowers from late spring to summer are attractive to bees and birds. Persoonia chamaepitys is a plant that will grow beneath Eucalypts. Also suited to growing in containers and rock gardens or along the top of a low retaining wall. Propagation is from cuttings, from seed is possible but germination rates are poor. Height – To around .3 metres. Flowers – Small yellow flowers in spring to summer.